The effects of aging tend to sneak up on all of us—even our pets—but because they happen so gradually, they can be easy to miss. If your dog is starting to bump into objects around the house or your cat isn’t spending as much time in her favorite lofty perch, a few environmental changes may be in order. November is Senior Pet Month. Help make your pet’s golden years as comfortable as possible with these six tips. Many puzzling behavior changes, from inappropriate elimination to inappetence, can be attributed to pain in older pets. Just like humans, dogs and cats often develop painful chronic conditions, such as arthritis, as they age. This can make everyday activities like climbing in and out of the litter box or bending down to eat particularly uncomfortable. Try offering your cat a shallower, low-sided litter box that will be easier on her joints or elevating your pet’s food and water bowls to a more comfortable level. While you’re at it, take a look at other areas around your home that may be causing problems for your pet. For example, if your pet’s favorite bed is located upstairs (or on top of the cat tree), consider moving it to ground level instead. Of course, if your pet is showing signs of pain, such as limping, stiffness, reluctance to climb or jump, repeated licking over a joint, or changes in personality, it is important to also schedule an appointment with your veterinarian, who can narrow down the problem and develop a plan for treatment. 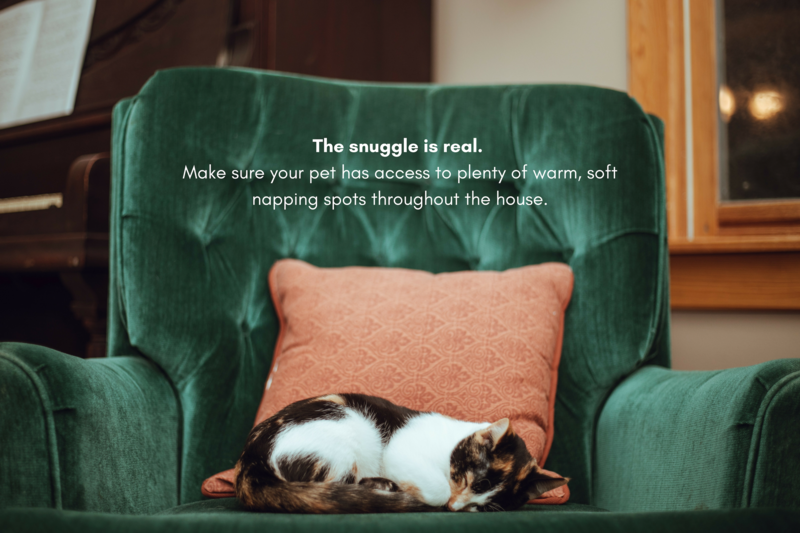 While your pet may have found the floor a perfectly acceptable place to sleep in her younger days, she’s probably looking for an upgrade in retirement. In addition to struggling with chronic pain, many older pets have trouble regulating body temperature, so bedding should provide support for aging bones and joints as well as warmth. Create a cozy retreat by moving your pet’s bed to a sunny area of the house and adding a few extra blankets or even a heating pad. Keep in mind, however, that these should only be used on the lowest setting under direct supervision. Some pets—particularly small or short-haired breeds—may also benefit from a jacket or sweater, especially in the winter. Walking on slippery surfaces, such as tile or hardwood floors, can be dangerous for aging dogs. 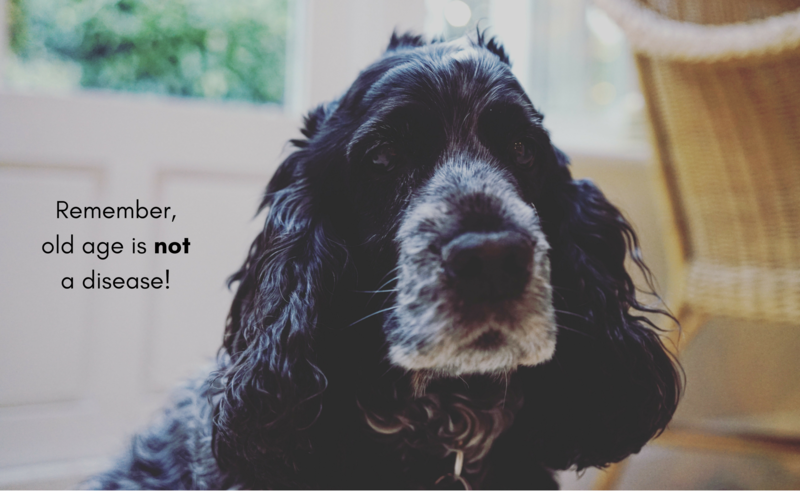 Before making changes to your home, first ensure both the nails and the hair between your dog’s toes are not too long as this can often cause slipping. If your dog is still having trouble getting her footing, try adding a few nonslip rugs or yoga mats to the most heavily trafficked areas of your home to help provide traction and prevent falls. Booties, socks, and toe grips can also help. Navigating even familiar places can present a challenge for pets with vision or hearing loss. Make things a little easier on your senior pet by keeping your home consistent as much as possible (avoid rearranging the living room or moving her food and water bowls to a new location), clearing clutter, providing additional light where possible (invest in a nightlight or two), and blocking off hazards, like stairs. If your dog is hesitant to jump in the car or your cat no longer sleeps in the cat tree, you can bet it’s not because of a change of heart—instead, she’s likely suffering from pain that makes these once-enjoyable activities uncomfortable. Investing in a ramp can ease the stress on your pet’s joints and allow her to get back to normal life. Just like humans, pets can develop a number of new health issues as they enter their senior years. While many of these issues are attributed to old age or “slowing down,” the truth is, most age-related changes can be effectively treated or managed with proper veterinary care. Ensuring your pet is healthy with semiannual wellness exams is key to keeping her happy and comfortable at home. Have we seen your senior lately? Contact us or schedule an appointment!